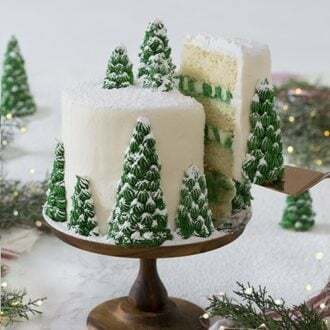 This moist, fluffy, and delicious Christmas tree cake has vanilla layers enrobed in creamy, vanilla buttercream, covered with beautiful Christmas trees that turn this cake into a dreamy winter wonderland. 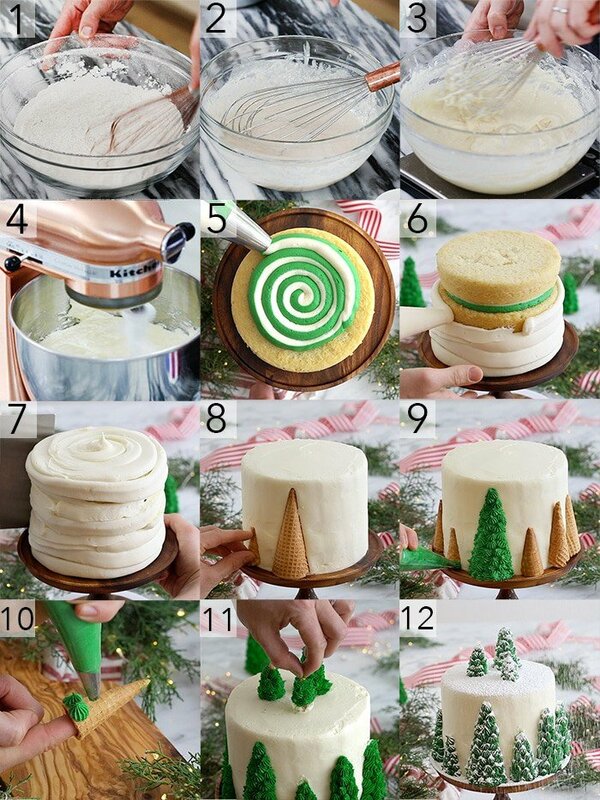 If you saw my Christmas tree cupcakes you know where I got the inspiration for this cake. I cut up a few ice cream cones and used them as the base for various sized pine trees on the side and top of my cake. Little dollops of green buttercream and a dusting of powdered sugar complete the snowy winter scene. The real star of this dessert is the cake itself! So pillowy soft and delicious. I made mine with “plain” old vanilla but you could add in some peppermint extract, orange blossom water, lemon zest or whatever else you love to make this cake your own! To pipe the two-tone frosting you fill one bag (1/2 way full) with white frosting, one bag with green frosting and then put both bags in a third piping bag. No need for a tip, just snip about an inch off each bag. I like to give a really good dusting of powdered sugar “snow” to the trees for some added realism and depth. If you don’t have a #30 tip then try any small to medium star or leaf tip to pipe the tree. 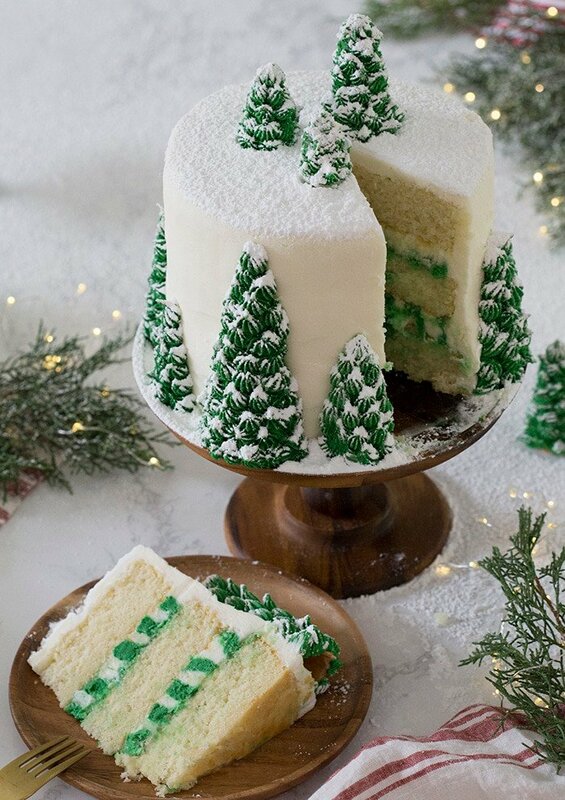 The trees can also look cute with little sugar or fondant ornaments and presents, too! I actually applied white ornaments to one tree with tweezers. It looked good but they kind of got lost in the snow. SO not worth the effort, for me at least. Hope you enjoy!! Cake decorating to be a bit intimidating then check out my How to Decorate a Cake post, it has lots of helpful tips and a full how to video. Butter and flour three 6-inch pans. I use damp cake strips on my pans for a more even bake as well. Preheat the oven to 340F. Whisk all of the dry ingredients together in a large bowl. Add the wet ingredients to the dry and mix until combined. Divide the mixture evenly into the cake pans, which you’ve buttered and floured. I like to use a kitchen scale to measure for even layers. For the buttercream; beat the room temperature butter until light and fluffy. Add the confectioners sugar, vanilla, and cream. Mix and add the food coloring. For the frosting; Cream the butter, add the sugar, then mix on high. Add the milk a tablespoon at a time until desired consistency is reached. Add green food coloring, mix until combined then transfer to a piping bag. Once you have your two-tone piping bag ready, pipe and stack your layers. Grab your piping bag filled with only the buttercream, snip off the tip and pipe a full layer all around and on top of your stacked layers. Smooth out the buttercream on your cake using a bench scraper. Grab an angled cake spatula to smooth out the top and edges. For the Christmas trees on the side of your cake, use a serrated knife to cut the ice cream cones into different sizes. Once you have a variety of desired sizes, carefully cut them in half and place them around the side of your cake. For the cones on top of your cake; go ahead and pipe those dollops on before placing them on your cake. You can save the “tippy top dollop” for after they are placed on the top of the cake. When the trees are frosted, arrange them on the top of the cake, then go ahead and pipe that last dollop at the top of the cone. Last, but not least, sift confectioners’ sugar onto the top of the cake and all on those trees and it’s ready to serve! 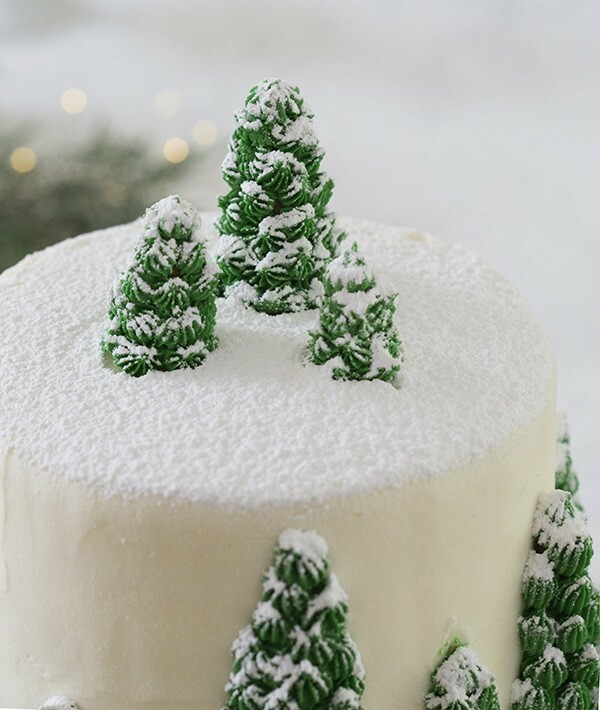 A delicious vanilla Christmas tree cake with creamy, dreamy vanilla buttercream, covered with beautiful Christmas trees that turn this cake into a winter wonderland. Cream the butter. Add the sugar and mix on high. Add the vanilla and salt. You can also add milk a tablespoon at a time to get a smoother consistency if needed. Divide the buttercream into two batches. For the colored batch, add the green food coloring, mix until combined. For the Christmas trees on the side of your cake, use a serrated knife to cut the ice cream cones into different sizes. Once you have a variety of desired sizes, carefully cut them in half. Use a number 30 tip to pipe star-shaped dollops onto the surface of the cone beginning at the bottom and working to the top. Place the cones that have been cut in half on around the side of your cake before piping. When all of your trees have been piped and placed, sift confectioners' sugar onto the top of the cake and it's ready to serve! I like to give a really good dusting of powdered sugar "snow" to the trees for some added realism and depth. If you don't have a #30 tip then try any small to medium star or leaf tip to pipe the tree. how did you make sure the cones didnt break when you cut them? any tips? I would just say be very careful and used a serrated knife! Thank you so much for this amazing cake inspiration. I combined your Bob Ross cake with this to create a mountain scenic cake for my friend’s birthday. I’ll be delivering it to him and cannot wait to see his reaction. Question: I would like to make the cakes a week in advance of me decorating them. Can I put them in the freezer or should I do the fridge? If you don’t think these would fair well being made in advance, let me know that too! I think you can freeze them. Just wrap REALLY well! Yes you definitely can freeze cakes, I wrap in plastic, then foil. They turn out great and are as fresh as first day you baked them. Be sure and cool completely before wrapping. They are also easier to handle especially larger cakes, and when putting cakes together if they are cold, they don’t crack as easily. I love watching your videos and am currently as I type this baking this very cake! I have a cousin who is having an open house (new home they built) tomorrow for close friends and family and when I watched your youtube video of this cake the day you posted it, I just KNEW that was what I needed to take up to the party! They have a vaulted ceiling with a huge Christmas tree that almost reaches the top, plus we live in Western Montana within in the \Mission Mtn Range of the Rocky Mountains so it is just SOOOOOO appropriate for the occasion, location and event! Thank you, thank you for making these wonderful tutorial videos for us home bakers. IT helps so much and I look forward to posting a photo of my finished product once it’s done. I made 3 8″ layers so doubled your recipe. Stephanie I plan on making this as an 8” cake as well. Can you tell me how many trees you put on the side and how many on top of your cake? Was it very time consuming to pipe the icing onto the cones? John makes it look so quick and easy! Thank you in advance for your help! Yay! Glad you enjoyed the cake! John this cake is gorgeous and I’ve already started cutting the cones to make it this weekend for a holiday party. Can you tell me how many total trees are on the side of your cake? It’s hard for me to tell from the picture. If I were to make this as an 8” cake how many trees do you think I would need for the sides? I want to make sure I have enough cones. Thank you again for your inspiration! Hi there love your videos! On this one you say 1 tbsp of vanilla but the recipe that you have written says only 1 tsp… and there is also no salt listed.. I noticed same thing. Have cakes in oven and unfortunately followed written recipe before watching video. Also did not melt butter which sounds okay. But hope there’s enough vanilla taste and lack of salt doesn’t affect taste too much. The salt is optional. I like to add it for a bit of contrast. I hope you enjoyed the cake. It looks Flawless!!! Congrats on your recipes and videos. I Just have one question: can I get a stable italian meringue buttercream frosting in a warm weather like Brazil? My daughter made this last night for my group of Bunco friends . Everyone was in awe of how beautiful and delicious it was! She LOVES watching your videos and gave you a shout out on her Instagram page. Happy holidays! Yay! So happy to hear it was a hit!! Can’t wait to make this next week. Enjoyed your video. I made your Christmas tree cake today but did not like white so I made my chocolate cake inside. I had a good serrated knife but it did cute my finger too because I did not watch you video how to prior lol. Great turnout. I did it!! It was so fun and it turned out great. I used the green matcha powder and LOVED the color and the lack of chemicals!! Thanks! YAY!! Love that you used matcha!! Do use a 6×2 or 6×3 pan? I use 6×2 inch pans. Yes, I did make the cake and it was good. the peppermint added was good. 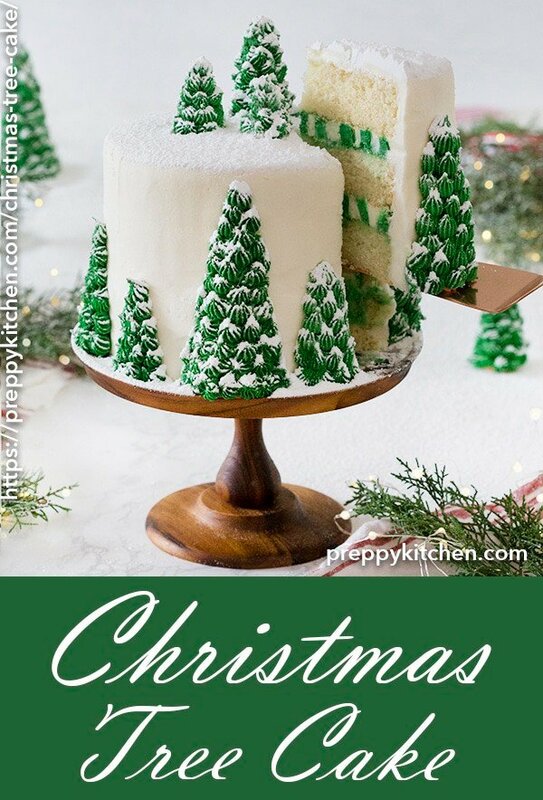 The only thing that was hard for me to read was the buttercream for the cake and the frosting for the trees. I ended up putting them together then separated it for the green trees. Other than that the recipe read great. Cutting of the cones was not too bad. Granted your cake is beautiful mine well I have not decorated in 20 yrs and it turned out not bad. I just wanted to say, “Thank you!” Your recipes were my “go to” recipes this Christmas. I’m a busy mom of seven boys but wanted to make the holidays special. We had so much fun making your sugar cookies..I used the recipe as my base to so many cookies. And I made this Christmas tree cake as well the Christmas tree cupcakes. Everything was amazing. For the Christmas tree cake, I used your Apple spice cake and brown butter frosting. It was seriously the most delicious cake I’ve ever made!! Thank you! If I can figure out how to post pictures, I’ll send them to you. My boys loved everything! You’re the best.. Keep doing what you’re doing!! Thank you and hope you have a wonderful new year! John I am so glad I found your YouTube videos. I made this cake for our Christmas Eve dinner. It turned out beautiful. My guest loved it. I also made it for a friends Dec Birthday who has big family. I made the 9 in one. Whew lots of trees!! She loved it. Please keep making videos . There so helpful! My husband calls you Preppy Chefy!! He loves it when I make your recipes! Keep creating thank you. I’m happy to hear everyone enjoyed the cake and how much you enjoy the recipes! Thanks so much for your positive feedback. What will you bake next? !